The third Pro Tour of 2017 is about to go down in Kyoto, Japan. Mercifully, the oncoming festival of excellence lands just as the Standard format has finally escaped the shadow of recent card bannings. After two seasons ended up requiring the banning of cards, the entire community wants to see a diverse and balanced metagame emerge at this tournament. With Emrakul, the Promised End, Reflector Mage, Smuggler’s Copter, Aetherworks Marvel and Felidar Guardian[/mtg_Card] all banned, the format is by all accounts in a pretty diverse and health spot heading into the weekend. As per usual the world’s best players have been hunkered down in their various Oni dens in Kyoto, Japan for the last week or two, all seeking to answer the only query that matters: is there a fresh deck or reconfiguration of existing archetypes out there that will allow them to catch the field off balance while offering consistent play against the known quantities in the field? With $250,000 USD on the line, and $40,000 for the champ, players looking to Top 8 need to marshall both luck and skill to lock down the trophy. Taking a look at the results from the last major StarCityGames Tour Standard tournament, the Top 8 field features elements both familiar and relatively recent. Here was the Top 8 from SCG Open Cincinnati. For we finance types, this is not a super exciting scenario. With a wide open field, play skill and nuanced sideboard choices + luck may carry the day, and that’s without accounting for the six rounds of draft factor. All of that adds up to an event that is likely to generate the usual number of hypes spikes, but may not be able to sustain those prices heading into next week unless a truly dominant strategy emerges. ‘As per usual, it is worth noting that the Pro Tour currently requires that players succeed in a mixed schedule of booster draft (HOU/HOU/AMK) and Standard play with 3 rounds of draft Thurs night , followed by 5 rounds of Standard starting around 2pm EST/11am PST, Friday. Will any of the teams find a way to unlock a hot new deck with solid game against the entire field? Will a fringe deck from the early weeks of the format suddenly end up perfectly positioned to take off? Will there be a chance to get in on a must-have card that shows early promise or will the hype train leave the bandwagon speculators out in the cold without enough buyers come Monday morning? Follow along as we explore Pro Tour Hour of Devestation all weekend! Editor’s Note: We will not be providing round by round coverage this weekend, due to vacation scheduling but we will provide relevant notes as the weekend progresses. Heading into this Pro Tour stop, many of the most obvious specs have already played out and plenty of advance speculation has been going down. The potential for further spikes is still on deck, but so is the strong likelihood that some of these specs will collapse when they inevitably fail to join the central meta narrative of the weekend. There are at least a few versions of the God-Pharoah’s Gift decks floating around and they all look like a ball to play. Basically, you get a bunch of good creatures in your yard and then start overwhelming your opponent by bringing them back more often than they can find removal or good blocks to deal with them. If the format isn’t dominated by aggro, this might be a great place to be and at $3 (up from $0.50 or less), there’s still some room to grow here. I won’t be surprised if this pairing of cards makes the Top 8, but I will be surprised if they dominate the tournament. As such, the spec seems too risky in the fact of better options, and I think I’ll sit this one out. Originally underestimated and available under $1 during pre-order season, actual play with this flexible card selection/card draw spell sandwiched between two different bodies has proven it out as one of the better cards in the format. Four-color emerge decks run the full four in the main, alongside play sets of Elder Deep-Fiend, Grim Flayer, Haunted Dead and Prized Amalgam. From a financial perspective, as a rare from a new set that is already close to $10, this one feels like an auto-sell to me. There could be a few more dollars left to reap here, but if you were in early I think you need to be happy with $24 play set exits and move on. Mono-red aggro decks make up a solid 10% of the online meta, and their most promising spec (now that Earthshaker Khenra has popped) is likely the hasty god from Amonkhet. This will end up more promising if the decks that show up at the Pro Tour are running more than the usual two copies. with a full 15 months left in it’s Standard life, this is a solid spec with multiple possible inflection points given how frequently we see this deck post up in the meta. Alternatively you might look at Falkenrath Gorger, but generally mythics will beat rares for gains. Torrential Gearhulk: Can Control Get it Done? It’s hard to believe we had a shot at this card around $8 when it first released last fall. The power level on Snapcaster Mage’s big brother is undeniable, and the number of good control cards to flash back has only gotten better between all of the card draw, kill spells and counter spells now in the format. U/R Control is the most likely home for the big blue brute this weekend. This card featured a $30+ price tag a few months back but the weak interest in Standard in combination with a broadening format has weakened it’s ability to hold a higher price tier. There is an argument to be made to pick up a few playsets looking to unload them in the fall closer to $120 per play set, since it’s hard to imagine a shrunken Standard card pool not leaving this card near the top of the creature heap, but I’m going to stay away from this until I’m certain the format is regaining some of the bodies that were lost in the first half of the year. With U/W Oketra’s Monument decks spewing out a ton of tokens, there has been some early chatter that this card might show up in a God Phraoah’s Gift build that looks to reset the board in the mid-game and take over with a heap of Eternalized creatures. This deck is still emerging, but has been gaining momentum over the last couple of weeks, and the only problem is that the Cataclysmic Gearhulk slot is not necessarily a lock, given that there are multiple ways to build the deck. Fatal Push: Nowhere to go but down? The price of Fatal Push has fallen a bit since the last Pro Tour, but it’s future in Modern and Legacy is super secure for the foreseeable future. In Standard things have been getting very grindy and mid-game focused, and as a result there are likely to be less copies of the card in the Top 8 versus last time. That being said, your first play set is an easy hold since you’ll be using them for years. Beyond that, trading out next fall or early winter may be your best bet, but remember that there is a sweet FNM promo that may head off your road to profit. Through all the bannings Mardu Vehicles has remained a very steady presence in the Standard meta, especially at the local level, where many players who started on the deck are likely still on it. Some versions of the deck have taken to running Gideon of the Trials instead of the Zendikar version, but otherwise all the usual suspects are still in attendance in most lists. Heart of Kiran is still a four-of, but with the deck likely to represent a much more muted presence at this event, I think this card is likely to stall until rotation gives it a shot at being a strong gainer as the fall meta shapes up. Angel of Sanctions: Ready to fly? U/W Monument may not be running this main most of the time, but they certainly enjoy pulling three or four copies out of the board in their grindier matchups. This powerful angel is just $2 at present, so any kind of significant showing could easily push it up over $6 on a hype spike, with your resale potential strongly dependent on how many copies make the Top 8. This is a risky pick, but in a field this open, most of your options are. 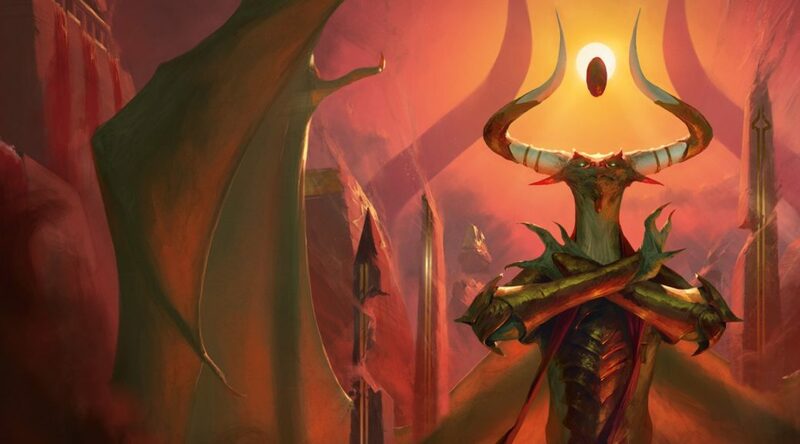 Stay tuned for our MTGFinance coverage of Pro Tour: Hour of Devastation throughout the weekend! Heads up James, W/U Momument got listed twice under the SCG results. Much appreciation for your quarterly reports here, they are wonderful! I really enjoy how much, and how often, you bring updates of the news. Thank you! Oh geez I just realized it was top 8. I heartily apologize sir. Oh geez, I just saw it was the top 8. I heartily apologize sir.